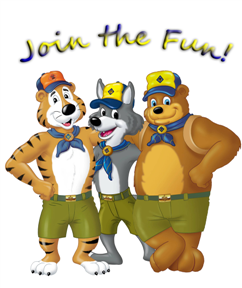 Cub Scouting is a family-oriented program that instills values such as citizenship, teamwork, honesty, respect, responsibility, and fitness, while being a lot of fun! The philosophy of Pack 225 is that scouting should be fun with a purpose. We want children to have a great time, while teaching them something along the way. We also believe that an important part of scouting is giving back to the community through community involvement and service projects. Although Cub Scout Pack 225 is chartered by the First United Methodist Church in Elkhorn, scouting is a non-sectarian organization, we have children of many different faiths in the Pack. Our Pack is part of the Southern Lakes District of the Glaciers Edge Council of the Boy Scouts of America. We have a great program for children in kindergarten through fifth grade. Older Scouts are able to join local Boy Scout Troop 243 as a part of the Boy Scout program. Most of our scouts attend one of the many schools in Elkhorn but we welcome any boys in the area who are interested in Cub Scouting. Our Pack currently has about 45 scouts. Come join the fun! Learn new skills and build lifelong friendships while having fun. Our Pack's activities over the past year have included camping, hiking, fishing, geocaching, sledding, rocket launches, derby racing and much much more. Our youth grow up fast. Give your children a valuable gift by encouraging them to join Cub Scouting today. The time you invest today will make a difference in the person they become tomorrow.